Taxing times for small businesses? But what does this mean for the self-employed and small businesses? The headline-grabbing change is that instead of an annual tax return, they will have to submit information four times a year. As can be seen above, this will come into operation from April 2018. These changes will be introduced only for some businesses in April 2018, with others being phased in by 2020, giving most businesses additional time to adapt. Consultation will take place this year as to which businesses go when. By 2020, most businesses, self-employed people and landlords will be required to update their information to HMRC at least quarterly via their digital tax account. Businesses will be required to use digital tools, such as software or apps, to keep records of their income and expenditure. Many businesses will choose to use one of the many commercially available tax software packages to compile their tax data as part of their day-to-day accounting activity, but HMRC will also ensure that free apps and software products are available as needed. 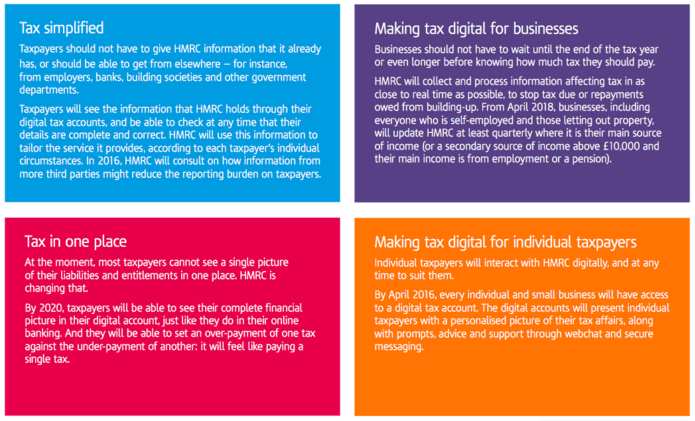 At least once a quarter, businesses will feed their data directly into HMRC systems via their computers or smartphones. At Fair Business Loans our passion is to see fairness in the world of finance. We want to see small businesses being treated fairly and any matters related to funding for small businesses presenting a good deal. So are these changes for better or for worse? The government assures us that updating HMRC directly in this way will be far less burdensome for businesses than the tax returns of today. The new system will also ensure that taxation is handled in real time - rather than months after the end of the financial year - making it easier for a business to understand how much tax they owe and budget accordingly. However, many small business owners fear what they see as the equivalent of completing “filing four tax returns a year” and there is an online petition to challenge the change. This has now reached over 100,000 signatures - the number needed for Parliament to consider the topic for a debate. So, watch this space!